If you have been following my blog for any time now you probably know that I love Mexican food. Who doesn’t right? You probably also know that I try and get out to eat at least once a week for work, and I typically go to my nearest Mexican restaurant, El Rey. When I have time, I also do a bit of quick shopping and this past week I cruised through the spice aisle to find Al Pastor seasoning. I’m a huge fan of tacos al pastor. They are my go to tacos wherever I go, so I wasn’t going to pass up this spice blend. Now what was I going to make with it was the big question. This is where my love of chicken wings came into play as well. I wasn’t making these so much for myself as I was for making them for my oldest son who loves chicken wings. As he usually eats them plain, yes I said plain, I wanted to put him through the test and see how he would enjoy them with the al pastor seasoning. Well, I was interested as well. That’s it. Very simple ingredients that make some of the best wings I have had in some time. I kept the entire chicken wing in tact. If you want to split the wing and the drummie, feel free. I like the wing tip as well. Again, your call. These wings are also baked. Baked until they are super crispy as that is how I personally love them. Start by adding the chicken wings to a gallon sized ziplock bag. Add in the al pastor seasoning and seal the bag. Toss the chicken around in the bag ensuring that all of the wings get a nice coating. Place these in the refrigerator for at least four hours, but preferably over night. Line a large baking sheet with parchment paper. Add the chicken wings onto the parchment paper and place in the preheated oven for roughly 60 minutes. After 60 minutes, remove the baking sheet from the oven, turn the chicken wings, and cook for another 30 minutes. Just keep an eye on the wings before 60 minutes as you do not want them to burn, however you want that skin to caramelize and get nice and crisp. When the wings are done, remove them from the oven and place them onto a serving dish. 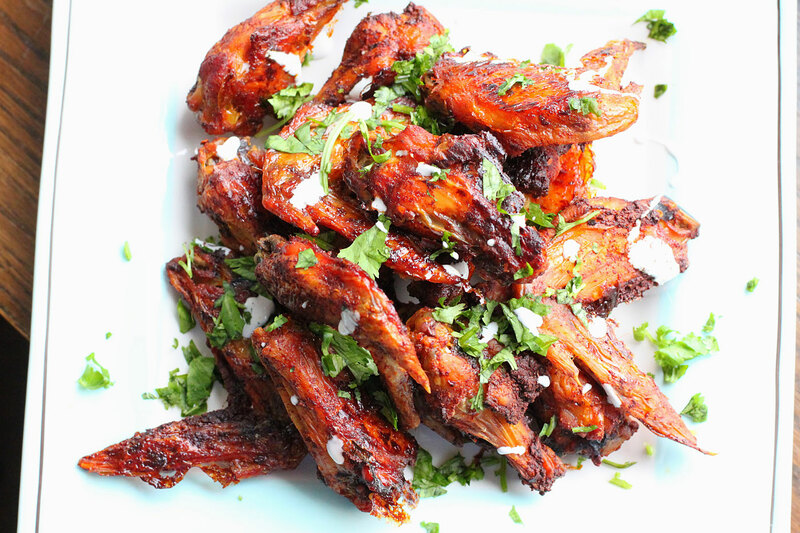 Shower the wings with the fresh cilantro, and drizzle a bit of the Mexican crema over the wings. Dig in. These wings were awesome. They were crispy with just the perfect sweet heat you would expect in some great al pastor. My son also loved them. I left him a big bowl of them on the counter and when he returned home from playing took a bit of caution as they were not the good ‘ol plain type, but after first bite he devoured the entire bowl. So if you can find al pastor seasoning at your store, pick some up and try them on some wings. I hope you enjoy. That's it. Very simple ingredients that make some of the best wings I have had in some time. Dig in. These wings were awesome. They were crispy with just the perfect sweet heat you would expect in some great al pastor. My son also loved them. I left him a big bowl of them on the counter and when he returned home from playing took a bit of caution as they were not the good 'ol plain type, but after first bite he devoured the entire bowl. this looks amazing. can you tell me where i can purchase the El Rey seasoning. I looked on line here and i dont see it. thanks. Looks delicious, and beautiful, as always. Any recommendations for online sources for El Pastor spice mix? Hi Lee – Unfortunately I do not have an online store that sells it. Your best be is to check with any of your local Mexican grocery stores and check their spice aisle. The ingredients in mine were dehydrated garlic and onion, chili spices, vinegar powder, lime powder, and paprika. Good luck! totally drooling right now. I’ve made your basic wings recipe and it was so easy and yummy!! Can’t wait to try this one! I don’t have El Pastor seasoning, but I do have packets of Sazon. I’m in a wings mood, so I might just sub it for the El Pastor. Thanks Michelle! I’m so happy you liked the baked wings. 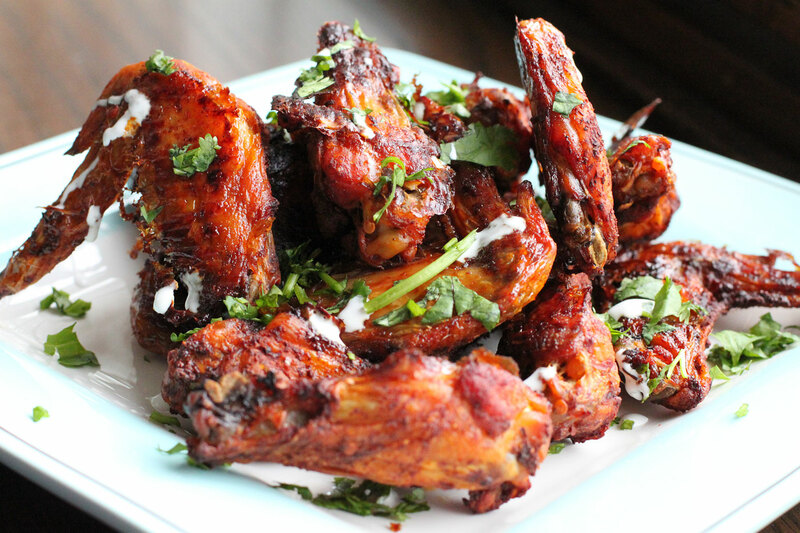 These al pastor wings were pretty darn awesome as well. Good luck with your sazon! Dax, I made these with the Sazon seasoning and they were soo good! I am bound and determined to find Al Pastor seasoning now! I made a second batch for apps for thanksgiving, 4# of them. They were gone in under 10 mins I swear! Thanks so much for the great recipes!!! Michelle – that is great to hear. Glad you loved the wings! could these chicken wings be grilled? i would like to use the al pastor seasoning. and grill the wings. Sure, feel free and try grilling them.